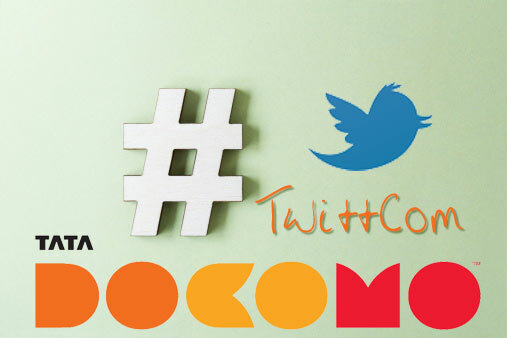 Here is one more good news for Tata DOCOMO GSM Customers, Tata DOCOMO Launches TwittCom. Now they can recharge and activate services with use of #Hashtags on Twitter. So get ready to recharge your mobile numbers via twitter if you’re TATA DOCOMO customers. Tata DOCOMO, the unified telecom brand of Tata Teleservices Limited (TTL) that has always adopted a different approach to bringing best in class services to its customers, today announced a first of its kind initiative. The company introduced a Twitter application TwittCom for its GSM Pre -paid customers that will allow them to recharge and activate a Value added service/ application through Twitter. First of its kind e-commerce initiative by a Telecom company in the world. The e-commerce initiative called TwittCom, has been developed indigenously by the team at Tata Teleservices Limited. For registering their numbers customers have to follow a simple process: go to the twitter handle of the company @tatadocomo, type in #reg <Mobile Number> and they will receive a pin code for verification through SMS. Once the verification code is received, customers need to go to the twitter handle again, key in #code <Pincode> and they will get a retweet confirming registration. For activating value added services the process is simple, a customer just needs to go to the handle (@tatadocomo) and key in #act# <Service><value>. They will get a twit back confirming activation of the service. Commenting on the initiative, Mr. Ritesh Ghosal, Head of Brand Marketing at Tata Teleservices Limited said, “As a brand, Tata DOCOMO has always differentiated itself with its Innovations, whether it is 1p/sec pricing for calls, or advertising, efforts have always been made to add value to the lives of consumers. So what do you think about this latest move by TATA Docomo by launching TwittCom service ? Share your views via comments below.